Where in the World is Direct Selling? Is your company in multiple markets? Do you want to be? Direct selling is a worldwide business model. Many direct selling companies do business in multiple countries. If you run an MLM, chances are you’re operating—or want to operate—in more than one country. When you’re looking to expand internationally, you need to do your homework. 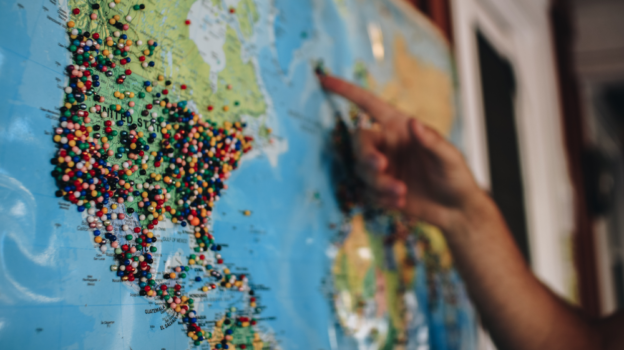 Before you move into any country, you need to study that country—study their culture, their sales numbers, their economic realities, and their regulations. Mark Rawlins wrote an in-depth guide on these considerations. Today let’s take a close look at the latest worldwide network marketing facts and statistics from the World Federation of Direct Selling Associations (WFDSA). The WFDSA represents 63 national direct selling associations and provides a wealth of information about direct selling and multilevel marketing around the world. 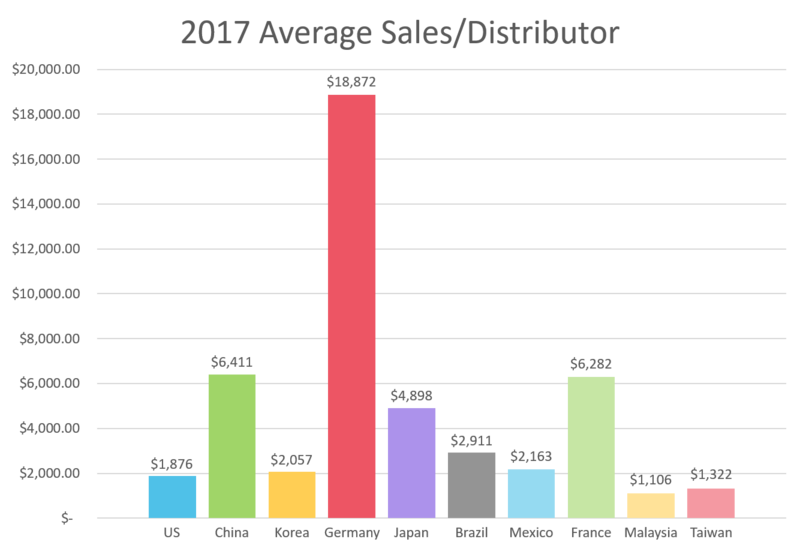 The most recent worldwide MLM statistics comes from 2017. Note: All monetary data included throughout this article is adjusted to USD. Asia and the Pacific generate most direct sales worldwide, followed by the Americas and Europe. 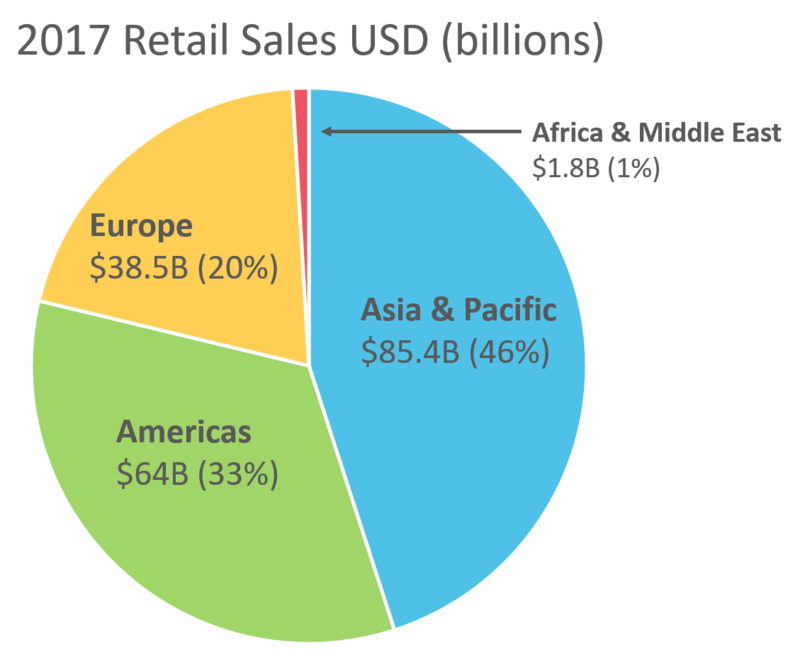 Although Africa and the Middle East (represented in WFDSA data as one region) produced the least sales, they showed the greatest amount of growth in 2016—up 9.9%. Wondering what products sell in these growing markets? Check out this Africa-based MLM, Solar Sister. Although Africa and the Middle East saw the most growth, other regions grew in 2017 as well. Europe grew 3.5%, and Asia & Pacific grew 1.8%. On the other hand, the Americas sales numbers decreased but only by 0.1%. I don’t imagine this decline comes as a surprise to many of our readers. It seems like a lot of folks are nervous about the trend and that this is part of the drive toward international business models. But the sales numbers for the Americas are still high. In 2018, Allan Pollard of PayQuicker came on our podcast to argue that the dip is a natural part of the sales channel’s lifecycle—that the US is a maturing market for network marketing and that the business is in an evolutionary step. Let’s take a minute to talk about distributors. In one region, the total sales might be greater and the sales effort each distributor needs to do might also be greater. Africa and the Middle East offer a standout example of the disparity between sales and distributors. Together these regions produce 1% of worldwide sales, but they are home to 3% of worldwide distributors. It makes sense if you think about it. I mentioned Solar Sister above. Their business model is selling small, solar electronics to poor consumers in rural Africa. If the product is for poor consumers, the price point is going to be very low. If the average price point is lower than in other regions, it will take a larger number of distributors to make the same amount of sales. On the other end of the spectrum, the highest sales region, Asia and the Pacific produce 46% of all sales, but 56% of all distributors live there. Again, more distributors producing lower dollar amounts. In both examples, individual distributors contribute less sales on average than their American and European counterparts. Note that this is a mean, not a median. In other words, it’s very likely that high-end distributors are skewing the numbers. Mean isn’t the most accurate measurement of what the “typical” distributor makes. But it’s a much easier number to come by and it’s still an interesting number to look at. While Asia and the Pacific are racing ahead in total sales numbers, their sales per distributor are lagging behind the Americas. The Americas, in turn, are behind Europe. Asia’s collective buying power is greater, but on an individual level they have less buying power. If you take your products from Europe to Asia, you might need to rethink pricing, packaging, or even the product itself to maximize your potential in those markets. In one region, the total sales might be greater and the sales effort each distributor needs to do might also be greater. And it might go without saying, but if you want to sell in the Middle East and Africa, the most competitive product might be completely different. By the way, that’s not a caution against entering those markets. You must tailor your strategy but if it makes sense for you to do that, do it! Individuals in Africa and the Middle East might have the least buying power, but the non-monetary benefit of operating there can be substantial. Remember the work that Solar Sister is doing selling low-end solar tech in Africa. Sure, they’re making less per-sale than they would selling high-end solar tech in the US. But that’s not what matters most to their business. The United States and China are neck and neck—both generating 18% of worldwide sales. The US still has an edge of about $600M. Several countries outside the top ten grew dramatically in 2017. 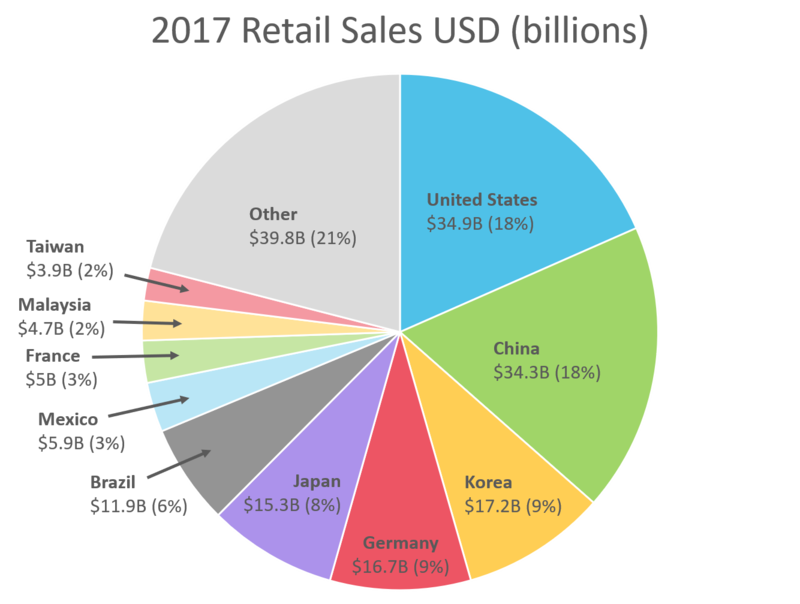 Indonesia, Kazakhstan, Philippines, United Arab Emirates, Argentina, Romania, Slovenia, Norway, Russia, and Turkey all had double-digit increases in retail sales. Very few countries saw a substantial decrease. Only the Netherlands and Belgium had double-digit drops in sales. The WFDSA also shows us the number of distributors in each country. Unlike the regional numbers we looked at above, these numbers don’t track the sales numbers for each of the top 10 countries. Not all distributors will be able to generate the same sales numbers. And some of that disparity has to do with the practical circumstances surrounding distributor lives. German distributors are so far ahead, it seems like an error. (We triple checked our math.) China, France, and Japan also have what I would consider high per-distributor sales. Another issue you need to look at when expanding into a country is the average income of a person living in that country. There are different kinds of averages that you can look at. Again, median income provides a more accurate picture of the average person’s salary, but up-to-date data on mean income (specifically gross national income per capita) around the globe is easier to come by. Let’s look at those numbers for the top ten countries—excluding Taiwan for which there is no reported GNI. Income isn’t a strong predictor of whether direct sales will do well in a given country. From left to right, these countries are graphed from greatest total sales to least sales. Their per capita incomes are all over the place. 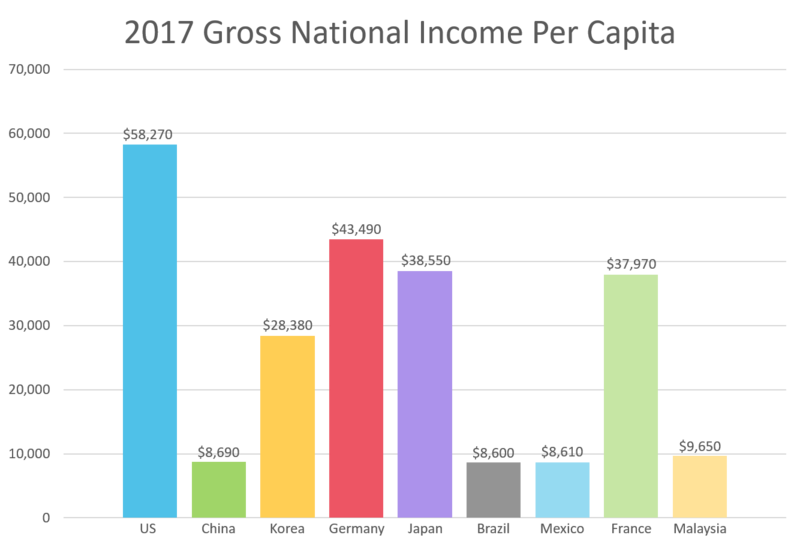 That said, all the top ten countries (the ones that reported GNI anyway) have a per capita income greater than $8000 USD. Which makes sense if you think about it. Most (though not all) MLM products are “luxury” goods. They’re typically things consumers want more than they need. In countries where people are struggling to survive, they’re not likely to buy luxury goods. Income also isn’t a strong predictor of average sales per distributor. 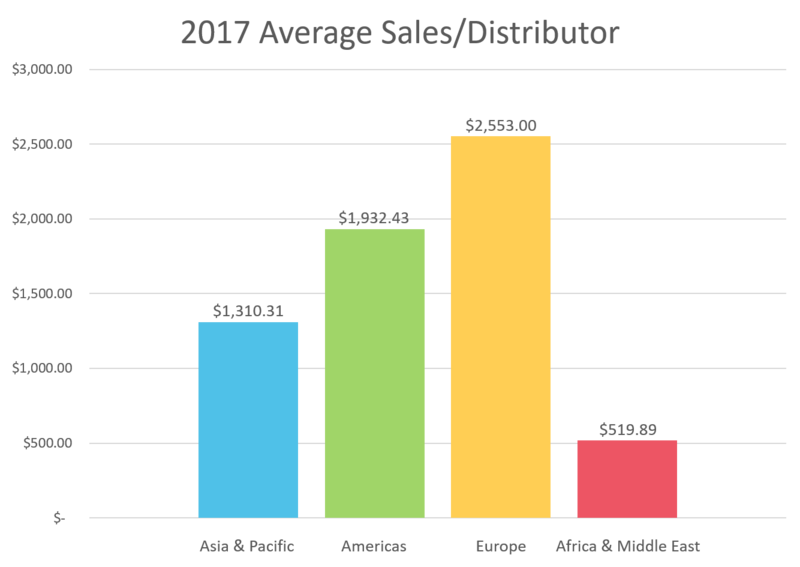 The US has the highest per capita income ($58,270), but it’s among the lowest in average sales per distributor ($1,876). The take away from these numbers seems to be that when you’re deciding if a country would be worth entering, you can’t look at the numbers alone and think you’ve done your homework. You have to learn more about the people you’ll be selling to than their income and buying power. You have to know who they are. In other words, culture—interest in and compatibility with direct selling—accounts for the prevalence of the sales model.